It was a pretty busy at IpBoG this week with around 22 attendees. We had about five games going on at once. I started off with Ca$h 'n Gun$ but was eliminated in the first few rounds. A couple of others were eliminated just before the end of the game and Danny claimed the victory. After I was taken out I joined Alex and Joe who were playing Dobble. It's a speed game, a bit like snap on steroids. Each card has eight symbols and each two cards have a single symbol in common. 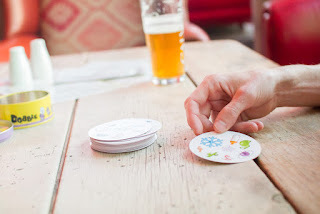 One of my favorite classic card games is a speed game Spit, so unsurprisingly I liked Dobble quite a lot. I was sure I was doing well at it too until it came to count up the cards and I'd come last. 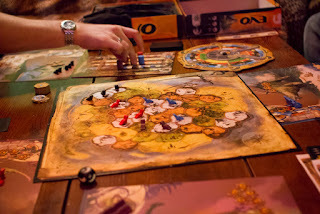 Next I played Splendor. I felt I was doing pretty well but Matt just beat me to fifteen points, winning him the game. A few weeks ago Alex brought Rattus, this week he turned up with the card game version, Rattus Cartus. After bringing Black Friday last week, Mike brought another stock market game, Hab & Gut. After Splendor I played Evo, a game about evolving dinosaurs which comes with actual dinosaurs. Well, not actual dinosaurs but small wooden ones. We ended with a double tie, two players had 39 points and two players had 26 points. I finished off my night with Eminent Domain: Microcosm, a two player little microgame. I got my revenge against Matt for Splendor, beating him at this game. Plenty of other games were played. An abstract called Quaridor, Citadels, Black Fleet, Ventura, a couple of games of King of Tokyo and more Dobble.